Ambush Board Co., a principal in progressive Action Sports Retail, and Remote Wakeskates, a brand built around riders and their lifestyles, announced today the release of an extremely limited edition Remote wakeskate in collaboration with Ben Horan. The collaboration features classic Remote shaping and construction in a 40” shape, and boasts a striking, exclusive swamp-themed graphic by a Jarod Harper. Ambush and Remote logos are displayed proudly together on the base honoring the companies' collaborative goal of ensuring wakeskating’s continued advancement. 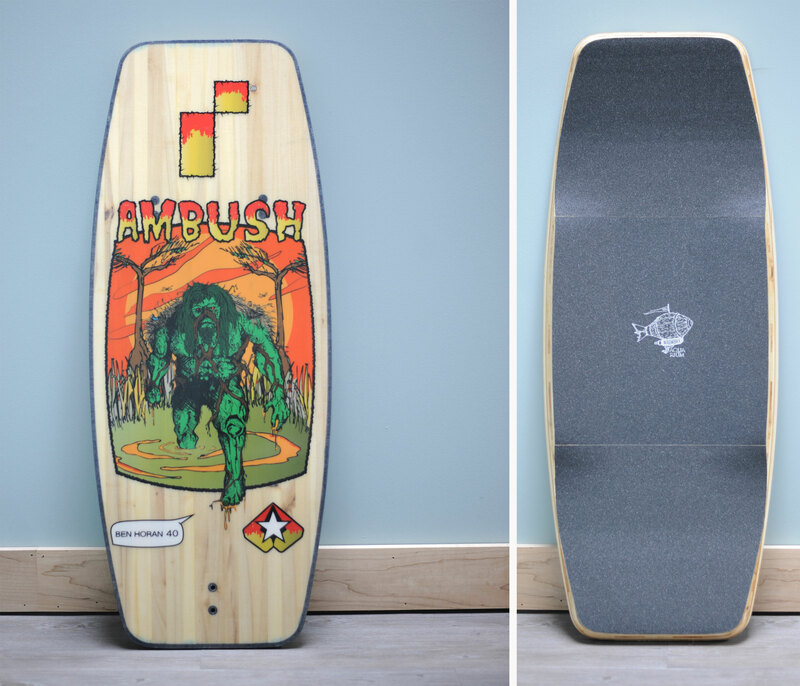 A mere eleven units were made available for purchase exclusively at Ambush Board Co., AmbushBoardCo.com, and BuyWake.com. The deck comes factory gripped with Aquarium Hardgoods griptape and a single Aquarium Reggie fin. For more information on this true limited edition collaboration, contact Ambush Board Co. at Sales(at)AmbushBoardCo(dot)com or call (800) 408-9945. AMBUSH BOARD CO. is a universally recognized global leader in Action Sports retail. Founded in 1997 in Kennesaw, Georgia, Ambush is owned and operated by a core group of devoted skaters, wakeboarders, and snowboarders who are deeply invested in the Action Sports community, and has evolved by staying true to their essential principles of Service, Knowledge, Integrity, Commitment, and Passion. Ambush always has been and always will be unyielding in their collective efforts to push the progression of Action Sports retail.